If you’ve ever crashed during a workout because you didn’t eat enough, or gave new meaning to the word “burpees” because you ate too much of the wrong thing (we’re looking at you, chili cheese fries), then you know how important pre-workout nutrition can be. And if you’ve never given it much thought, it can be easy to get wrong. Timed-nutrition — eating the right foods at the right time — is a big part of Autumn Calabrese’s 80 Day Obsession program. Eating food at specific times helps your body fuel your workouts, build muscle, and recover while keeping your energy levels high. Use page 4 of the 80 Day Obsession Starter Guide to determine which calorie-level meal plan is right for you, then check out the pre-workout meals we’ve created below. Top steamed or roasted asparagus with a pair of eggs. Hard-boiling the eggs makes for easy meal prep, but if you like your eggs poached or soft-boiled, the yolks will create a luscious sauce. Serve with baked sweet potato or atop a slice of toasted whole-grain, sprouted bread. 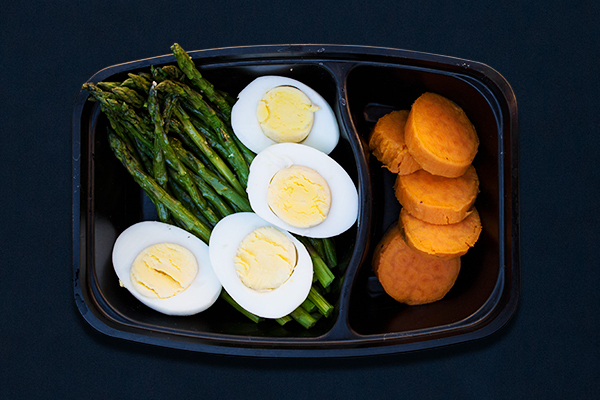 Meal Prep Tip: Bake a few small sweet potatoes, hard-boil a batch of eggs, and roast asparagus for several meals. In a rush? This grab-and-go dose of protein and carbs can be eaten on the run, and you won’t feel heavy during those booty-burning squats you’re about to do. Meal Prep Tip: Add olive oil to a heated pan and cook the spinach until soft, then add scrambled eggs and cook until just set. 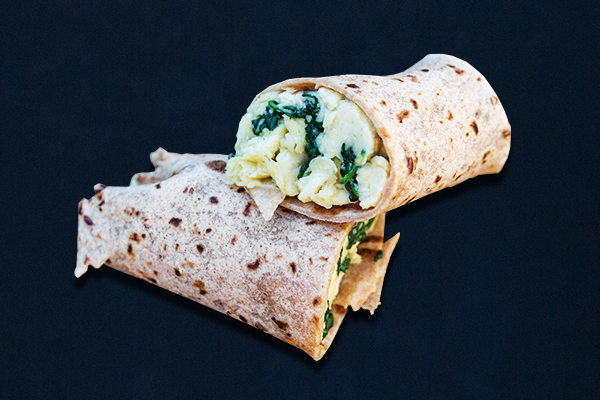 Spoon the egg mixture into a warm tortilla and roll. Breakfast burritos can be made ahead of time and frozen. Wrap individual burritos in sheets of wax paper, place in a plastic bag or freezer-safe container, and freeze. Reheat in a microwave for 2 minutes. 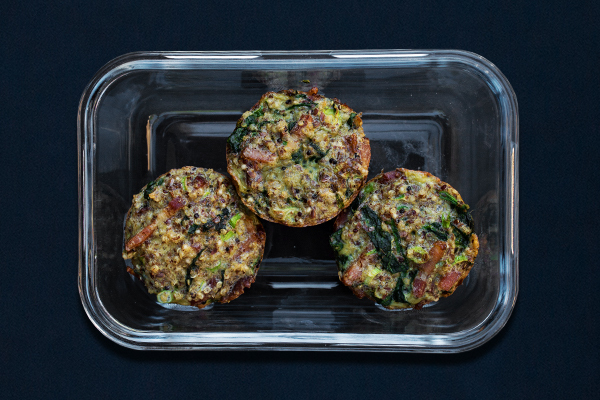 These savory muffins are perfect for meal prep. Why not make a big batch to freeze so you always have a healthy, pre-workout meal at the ready? Meal Prep Tip: Heat oven to 375° F. Cook the spinach with olive oil until just wilted. Transfer spinach to a bowl, add all of the remaining ingredients, and stir to combine. Then spoon the mixture into a muffin pan lined with muffin cups or coated with nonstick spray. Bake for 20 minutes. This amount of ingredients makes three muffins (one serving) and can be easily multiplied to make more. 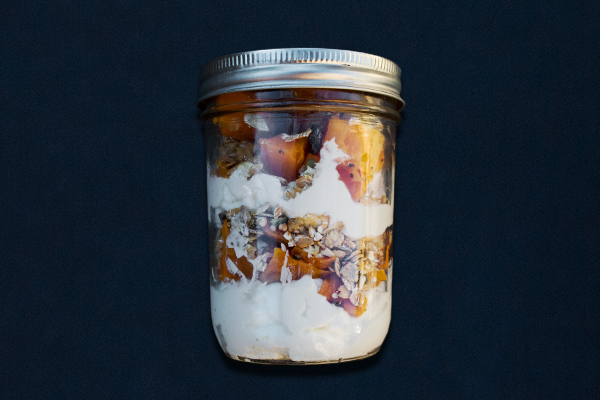 Packed neatly into a Mason jar, yogurt and pumpkin overnight oats is a perfect grab-and-eat breakfast before early morning workouts. Make several of these ahead of time to store in the fridge. Meal Prep Tip: Baking pumpkins, which are smaller and sweeter, are best for this dish. Peel the pumpkin, cut it in half, and scoop out the seeds, then cut it into bite-sized cubes. Place on a baking sheet, drizzle 1 tsp. of coconut oil per cup of pumpkin, sprinkle with pumpkin pie spice (or cinnamon), and roast in an oven heated to 375° F for about 30 minutes, or until soft. When cool, layer half of the yogurt, ½ cup pumpkin, and 2 Tbsp. oats in a jar or other container; repeat. Refrigerate overnight. Reach for this light combination of ingredients that will make your pre-workout meal feel more like a snack. This combination of ready-to-eat foods is perfect for days when you don’t have time to cook. 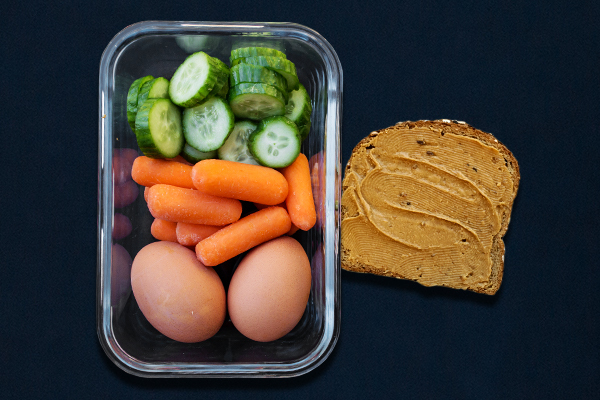 Meal Prep Tip: All you need to prepare ahead of time is the hard-boiled eggs. An electric egg cooker makes that fast and easy. Substitute any vegetables you like in this light, but satisfying grain bowl that can be prepped in advance and quickly assembled at meal time. If you prefer freshly cooked eggs with a soft yolk, try this with poached or sunny-side up eggs. 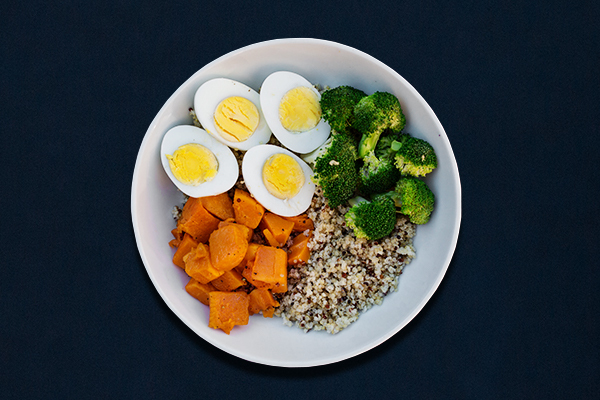 Meal Prep Tip: Every ingredient in this grain bowl can be made in advance! Roast all of the vegetables together, prep quinoa (or brown rice) in a rice cooker, and make a large batch of hard-boiled eggs. If you follow Plan D, E, or F, your pre-workout meal has the same containers as the lower-calorie meal plans, plus an additional purple container. Simply add any fruit from the purple container food list (½ large banana, 1 cup berries, 1 medium orange, etc.) to any of the meals listed above. For Plan F, add one extra teaspoon to any of the meals below. 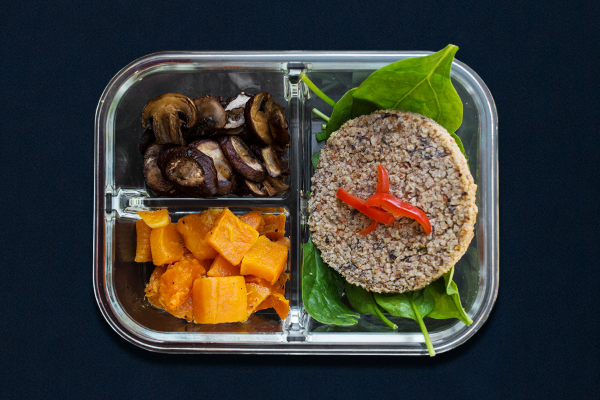 We served this veggie burger with roasted sweet potatoes for easy meal prep, but you can make an open-faced sandwich instead by toasting a slice of whole-grain, sprouted bread. Meal Prep Tip: Save time by baking sweet potatoes whole, then peel and cube them, if desired. Instead of sautéing, try roasting the mushrooms at the same time as the potatoes. Arrange sliced mushrooms evenly on a baking sheet coated with nonstick spray, drizzle with olive oil, and roast in a 375° F oven for about 20 minutes. Protein-packed tofu takes on the flavor and texture of scrambled eggs in this savory breakfast dish that gets its yellow color from turmeric. We like it with sautéed onion and pepper, but if you prefer something gentler on the tummy before a workout, you can swap them for a cup of spinach or mushrooms. Meal Prep Tip: Sauté onion and pepper in coconut oil. Add tofu and spices and cook until heated through. Serve with toast. 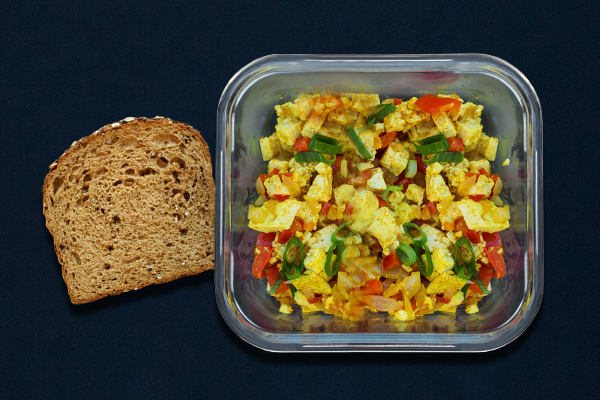 This vegan scramble keeps well in the fridge, so make double or triple the recipe and have your pre-workout meal prepped for several days.